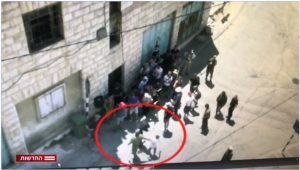 In response to communication from CAMERA's Jerusalem office, Haaretz English edition editors corrected both articles noted below so that they both now state as fact that TIPH employees were filmed carrying about abuses in Hebron. See below for a detailed update. In two separate articles late last week, Haaretz's Hebrew edition noted video documenting two incidents in which employees of the Temporary International Presence in Hebron (TIPH) carried out abuses in the disputed city, slapping a Jewish child and slashing the tires of a Jewish resident's car. Haaretz's corresponding English articles, however, were not so sure about the documentation, and has qualified these incidents as "alleged," or according to police reports. Videos, as the Hebrew edition reported, do indeed show these incidents. In recent months TIPH has been at the center of negative attention, following two incidents involving the group's employees, one in which a TIPH worker was filmed, according to the police, puncturing the tires of a vehicle belonging to a settler living in the city, and another in which a Swiss observer was deported from Israel after allegedly slapping a settler boy. Once again, the corresponding Hebrew article states as fact that the videos showed the abuse and vandalism, referring to "documentation" as opposed to unverified incidents. The Hebrew edition is right to report as fact that the videos show TIPH employees puncturing tires and slapping a boy. The Swiss government recalled the employee who slapped the child during a Breaking the Silence tour, and BtS itself condemned the abuse. Following the tire incident, TIPH expressed its "regret." Thus, there is no uncertainty that these events happened. For more instance of "Haaretz, Lost in Translation," see here. In recent months the organization’s people had become especially loathed, after dissemination of a security camera tape showing one of them slashing the tires on a settler’s car, and another video showing a TIPH operative slapping a child in the settlement. In recent TIPH has at the center of negative attention following two incidents involving the group's employees, one in which a worker was filmed puncturing the tires of a vehicle belonging to a settler living in the city, and another in which a Swiss observer was deported from Israel after slapping a settler boy.